Swimming with Elephants Publications, LLC would like to reintroduce to you to Jack Hirschman. 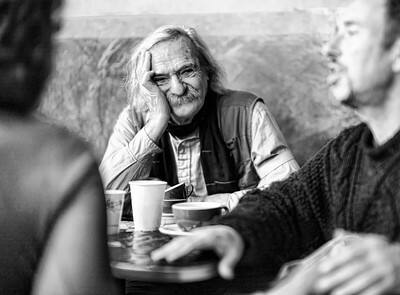 Jack Hirschman is an emeritus poet laureate of San Francisco, a member of the Revolutionary Poets Brigade, and the League of Revolutionaries for a New America. Both his publications with Swimming with Elephants Publications honor the work and words of revolutionaries from around the world. His first collection with SwEP, entitled Passion, Provocation and Prophecy, serves as an ode to Pier Paolo Pasolini. It contains an interview between Jack Hirschman and Justin Desmangles discussing the work of Pasolini and the influence his work has had over time. The interview is followed by two arcanes written by Hirschman which reflect on the man Pasolini was. Jack Hirschman’s newest release from Swimming with Elephants Publications is a translation of the poetry from Jusef Gërvalla, known as a journalist and a musician as well as a poet, novelist, and founder of the Marxist-Leninist group, the National Movement for the Liberation of Kosovo. In collection, entitled BEKIMI I NËNËS / A Mother’s Blessing, Jack Hirschman and Idlir Azizaj present a the first translation of Jusef Gërvalla’s poetry in the English Language. from Bookworks ABQ or order from Amazon or Barnes and Noble. Jack Hirschman (b. NYC, 1933) is the emeritus 4th Poet Laureate of the City of San Francisco (2006-2009). He has published or edited more than 100 books of poetry and essays, including translations from ten languages: Mayakovski (Russian), Neruda (Spanish), Artaud (French), Lombardo (Italian), Celan (German), Laraque (Haitian), Gjakova (Albanian), Gogou (Greek), Glik (Yiddish) and Nwadike (Swedish), among many others. His own major work is The Arcanes, (2006) published by Multimedia Edizioni of Salerno, Italy in the American language in which the two Arcanes in this book appear. It is a 1,000 page book of his longer poems, which he calls Arcanes, and a 2nd massive volume of more than 150 new Arcanes are scheduled to be published by the same publisher in 2015. He is a founding member of the Revolutionary Poets Brigade of San Francisco, and the World Poetry Movement in Medellin, Colombia.